To most people, the name of Pasiphae will mean nothing, and even to those people who have some knowledge of Greek mythology it might not be a name that is overly well known. In the Greek mythology though, there is a famous story of Pasiphae and the Bull, for Pasiphae was the wife of King Minos and mother of the Minotaur. 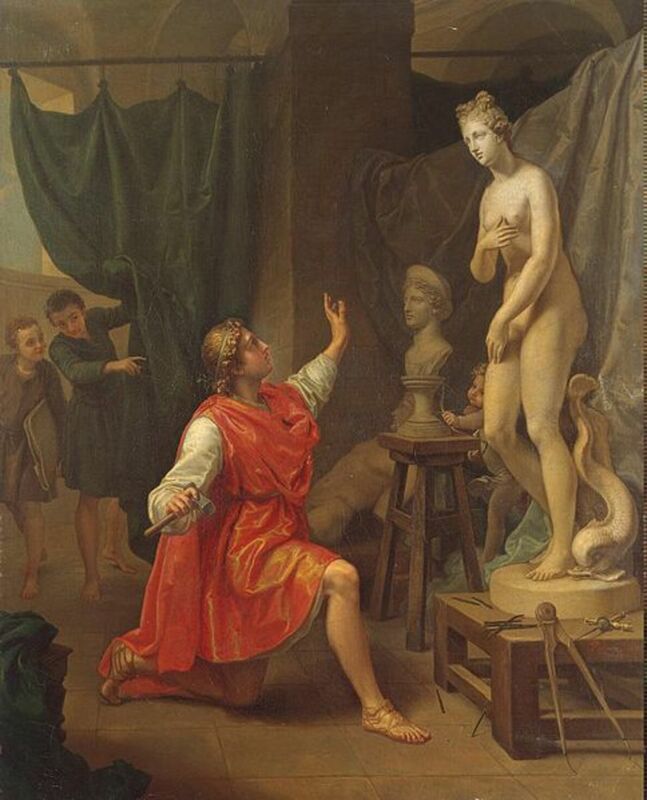 Today, the story of Queen Pasiphae of Crete is not one that is dwelt on for it focuses on a subject which is not talked about in Greek mythology, but the story of Pasiphae and begin with her parents. Pasiphae was the daughter of the sun god Helios, and the Oceanid Perse; this parentage made Pasiphae sister to Circe, Aeetes and Perses. Pasiphae was said to have the same magical skills as her siblings. Pasiphae would first be mentioned on Crete, where the sorceress married Minos, the son of Zeus and Europa. Minos would eventually succeed his stepfather, Asterion, as King of Crete, making Pasiphae Queen of Crete. Minos was not a faithful husband to Pasiphae though, and Pasiphae would use her magical skills to try and prevent Minos from straying. Pasiphae would cast a spell which would see the sperm of Minos transformed into poisonous creatures. These creatures would then kill any of the lovers that Minos lay with. Eventually, the spell cast on Minos by Pasiphae would be counteracted by a remedy produced by the Athenian maiden Procris. Procris was rewarded by the king with the gifts of Laelaps, the dog who always caught its prey, and the javelin that always hit its mark; presents that had originally been given to Minos’ mother by Zeus. Pasiphae herself would be placed under a spell when the god Poseidon cursed her. The curse from Poseidon was not due to anything that Pasiphae had done though, and was down to the errors of her husband. Poseidon had present Minos with a magnificent white bull to signify the god’s ascent to Minos being the new king of Crete. Minos though was so taken by the beauty of the Cretan Bull that he did not sacrifice it to Poseidon as was expected. In retribution, Poseidon would cause Pasiphae to fall in love with the white bull; transposing the love that Minos had for the bull into a physical form of love for Pasiphae. So Pasiphae lusted after the Cretan Bull, but she had no way to satisfy her unnatural desires for the bull of Minos. In the court of Minos though was the legendary inventor Daedalus, and so to aide Queen Pasiphae, Daedalus constructed a hollow, wooden cow. So lifelike was the wooden cow, that when Pasiphae entered it, the Cretan Bull mated with it. Thus, Pasiphae became pregnant by the Cretan Bull, and after the allotted time, the Queen of Crete would give birth to a son. This son was to be called Asterion, although he would become better known as Minotauros, the Minotaur; for Pasiphae had given birth to a son with the body of man, but the head and tail of a bull. As a baby, the Minotaur would be nursed by Pasiphae, and when he was a child he ran around and played in Minos’ palace. 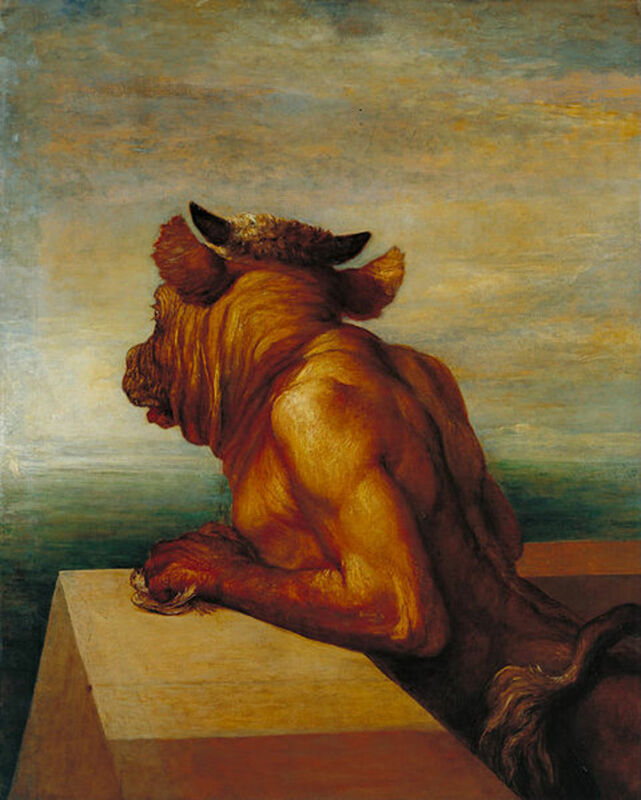 As he grew older though, the Minotaur became stronger and more savage, and a new home was found for the son of Pasiphae, and Daedalus created a gigantic labyrinth in which the Minotaur was kept. In Greek mythology, the story of Pasiphae tends to end with the birth of the Minotaur, although the story of her husband and son continue for a period afterwards. 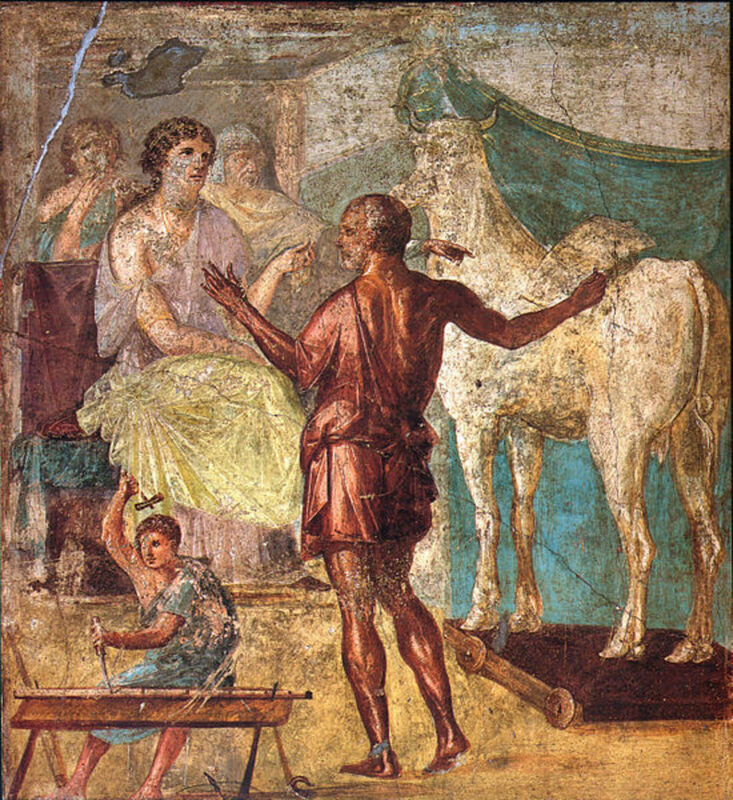 Pasiphae, in Greek mythology, was also mother to a number of other children by her husband, and these children also had roles in further tales. 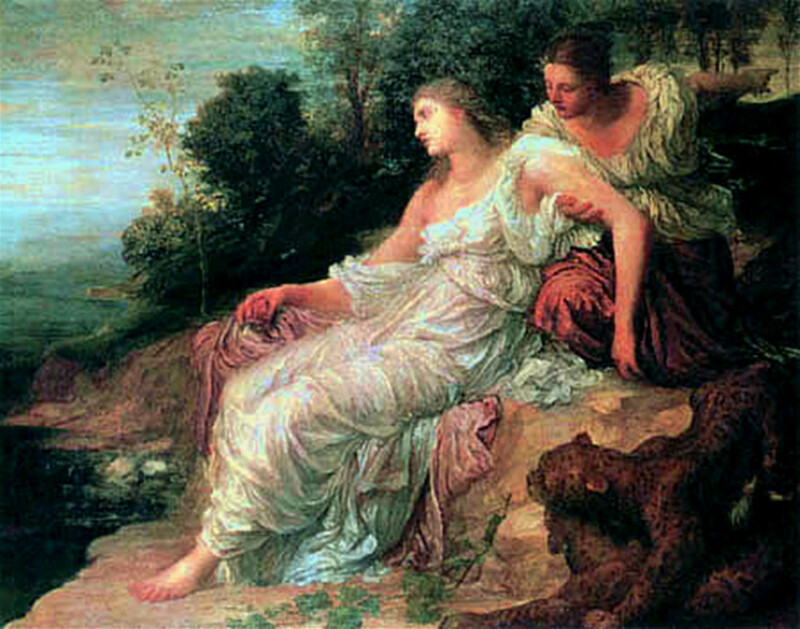 Ariadne – Ariadne would help Theseus when the Athenian prince arrived on Crete, and would also leave with the hero. Ariadne though would end up as wife of the god Dionysus. Phaedra – Phaedra was another daughter of Pasiphae who would be connected to Theseus, for she would actually end up marrying the Greek hero. 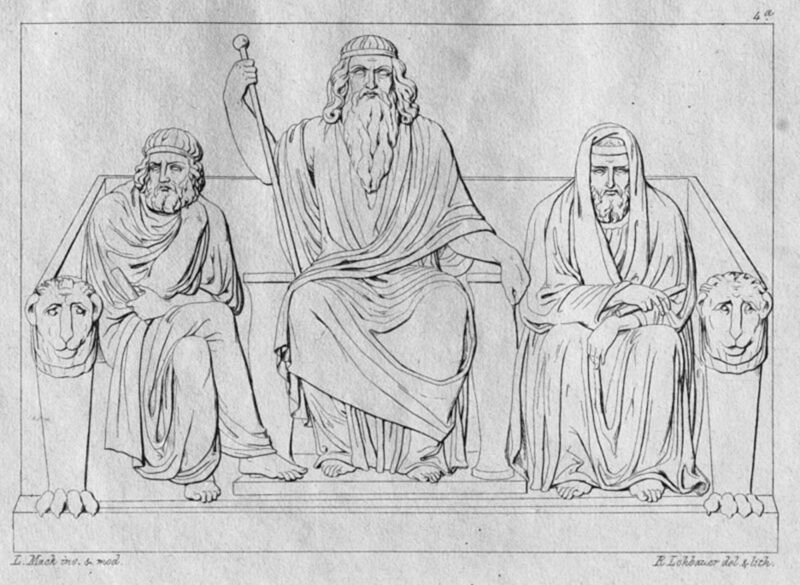 Androgeus – Androgeus was the favourite son of Minos, who was killed in Athens whilst partaking in the games held there. The death of Androgeus would lead to the sacrificial tribute of Athenian youths. Catreus – Catreus was a son of Minos and Pasiphae, who would become king of Crete after Minos’ death. Catreus himself though would mistakenly be killed by his own son, Althaemenes. Glaucus – Glaucus was the son of Pasiphae who was found dead inside a cask of honey, before he was brought back to life by the seer Polyidus. Deucalion - Deucalion was another son of Pasiphae who would become king of Crete; this Deucalion is different to the hero associated with the deluge. Acacallis – Acacallis was a daughter of Pasiphae who would herself become mother to two eponymous heroes, Cydon (with Hermes) and Naxos (with Apollo) . Theseus is one of the most famous of the Greek heroes. This is the story of how he entered the deadly maze of the labyrinth and encountered the Minotaur, half man and half beast. An overview of the origins of Minotauros and his myth. The figure of Daedalus is one who figures prominently in Greek mythology. 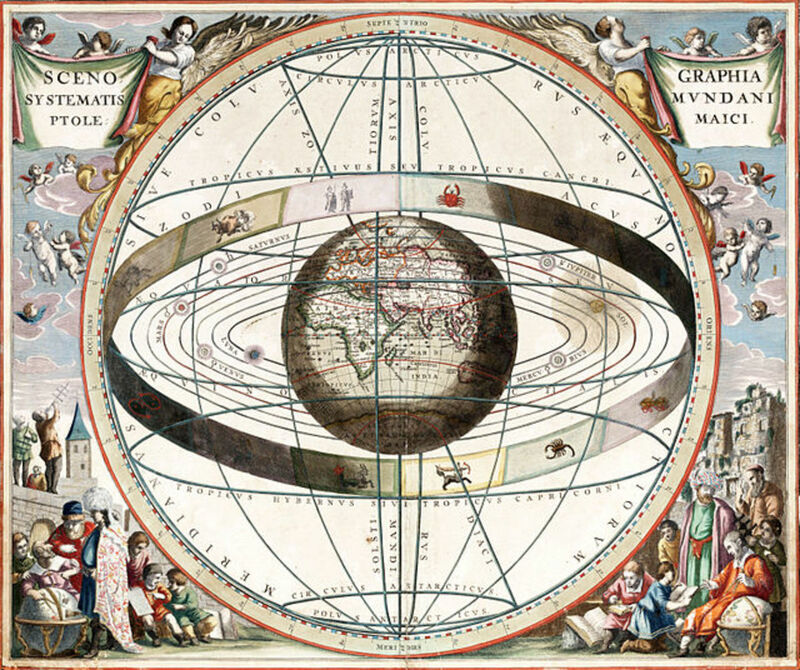 A master craftsman, his story crossed over with that of Minos, Pasiphae, Theseus and Icarus.